Many thanks to NMTC for your kindness and hospitality last week. Peter and I really enjoyed the production. It was a great production all round and the kids were lovely. Not many productions can boast a real Harley-Davidson. The story was very well told and with very believable characters. Bravo to all concerned! Thanks again. The production has whetted my appetite for more amateur theatre. Head of Stock & Amateur Licensing, The Really Useful Group Ltd. In a score requiring strong soloists from children and adults alike as well as a highly disciplined ensemble, NMTC was musically easily up to the job. Gibbs’ casting of Ian Stark as The Man was inspired and spot-on. It was a real treat to watch this talented tenor perform handling Lloyd Webber’s mix of pop and rock so naturally. Opposite Stark was a conveniently young-looking Samantha Pollitt, as Swallow, in her first lead role in the society. Looking ten years her junior, Pollitt brought plenty of naivety to the role which was reflected in her chemistry with Swallow’s younger brother and sister as well as the rest of the children’s ensemble. With two groups of seventeen children performing throughout the run, NMTC’s child-licensing team obviously had their work cut out, but it was worth it, with the children’s scenes arguably the most entertaining of the evening. ‘The Hurricanes’ group I saw were all well-rehearsed and focused – in my experience children often learn everyone else’s lines on top of their own, without even trying! Megan Timlin (Brat) and Harrison Willson (Poor Baby) deserve plenty of praise for their respective roles as Swallow’s younger siblings. And of course, the children’s ensemble also got to sing two of the show’s most popular numbers, When Children Rule the World and No Matter What, which went on to become one of Boyzone’s most memorable hits. “Whistle Down the Wind” is based on the 50’s novel written by Mary Hayley Bell, in 1961 it was made into a film starring the author’s daughter, Hayley Mills and Alan Bates. In 1996 Andrew Lloyd Webber wrote the musical version; transforming it from its Lancashire setting to a small town in Louisiana. The musical premiered at the National Theatre in Washington DC in December 1996 and later had its West End premiere at the Aldwych Theatre in July 1998. In my opinion, it is one of Andrew Lloyd Webber’s most underestimated musicals. “Whistle Down the Wind” is a delightful tale of a family of three children, who mistakenly think that an escaped convict found in their barn is Jesus. “The Man” asks the children not to tell anyone he is there, but such is their belief in who they think he is, they let all the local children in on their secret. All the children subsequently go to the barn to see “The Man” and pay homage to him. Northampton Musical Theatre Company must be congratulated for their interpretation of “Whistle Down the Wind” for it was indeed amateur musical theatre at its very best! The orchestra, so important in any ALW musical, was superb and under the direction of Graham Tear took us on a musical journey, from the spine-chilling melody of the overture through to the exciting climax of the musical. Tony Gibbs direction shone through the entire production, the castings were excellent and both principal and chorus work was of a very high standard. Ian Stark, who played ” The Man ” gave a mind-blowing performance, his vocals were exceptional and his Soliloquy was just awesome! The three children, Swallow, Brat and Poor Baby, played by Samantha Pollitt, Emily Halton and Robin Skeppstam worked well together as a family and all gave charming performances. The team of children (The Tornadoes) all gave excellent support to the central characters and clearly enjoyed being part of this company. Lillian Thorn (Candy) Tom Pinny (Amos) both portrayed their characters well and had good vocals. Mark Woodham (Boone) gave a sensitive performance as the father of the three children. The actors in the other supporting roles also gave confident performances. Technically the production was very good; the sets were authentic and I thought the barn set especially had that “worn in” rustic look to it. Well done to all the stage crew for their efforts in the show, however, there were occasions when scene changes could have been slicker. Costumes were all provided by the company and were all in keeping with the period. Props, lighting and sound were also very good and well executed throughout. Overall this was an excellent production with little to find fault with. 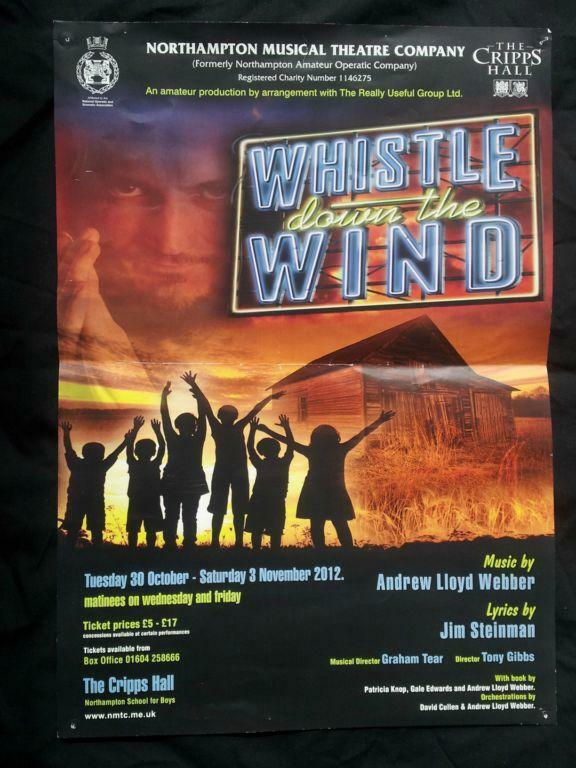 The entire company and production team should be very proud of what they have achieved with “Whistle Down the Wind”. Thank you Northampton Musical Theatre Company for a most enjoyable evening, I hope the rest of the run goes well for you all. Also, I must thank the company for the wonderful hospitality shown to my guest and myself. Special mention to Cliff for looking after us during the evening and telling us so much about the history of the society. The area premiere of Andrew Lloyd Webber’s musical, based on the novel by Mary Hayley Bell, played to very good houses at The Cripps Hall in Northampton. Whistle Down The Wind follows the fortunes of a fugitive caught between the prejudice of adults and the innocence of children in the deep South of America. 15-year-old Swallow (Samantha Politt) finds The Man (Ian Stark) hiding in the barn and his answer to her question “who are you?” is “Jesus Christ”… all the children, believing him to be Jesus, vow to protect him from the outside world. Ian gave to the role of The Man a tremendous amount of skilful acting, his presence and ability to show vulnerability and yet remain strong was a credit to him. Samantha was a beautiful Swallow, her excellent vocals and characterisation were consistently good throughout the show. Emily Halton as Brat and Robin Skeppstas as Poor Baby were delightful in their roles, both showing remarkable stagecraft for ones of tender years. I am reliably informed that the alternate roles played by Megan Timlin and Harrison Wilson were also successful in their respective portrayals. Tom Pinny, as Amos, again enhanced his growing reputation as one of the county’s finest young actors. His scenes with Candy, played by the extremely talented Lillian Thorn, were very well executed with a wonderfully balanced mix of tension and emotion. Lillian’s vocals were a highlight of the production. Among the supporting roles, Tristan Wentworth-Smith as the Sheriff and Snake Preacher David Mills were deserving of a mention – both giving strong consistent performances. The character work with the principals and children was, in the main, very good but I was a little perturbed by the apparent lack of awareness the Director, Tony Gibbs, had regarding the audience views from the balcony seating. With the unusual shape seating structure that the auditorium has, I was disappointed, despite not being in the most restricted of seats, that I was unable to see some important scenes due to the fact that they had been set on the downstage right edge. I understand this also applied to people sitting opposite with scenes downstage left. I generally like a minimalist set but I do think that the production would have been enhanced greatly by a little more thought to the barn staging. Having no sides to the barn removed the opportunity to use special effects during the blaze scene which I, along with many other audience members, thought was a great shame. Special mention must be made of the orchestra who, under the direction of Graham tear were excellent. Graham also took the role of chorus master and his good work certainly paid off, the company and ensemble singing was of a very high standard. Congratulations to NMTC for producing this area premiere and how good to see so many talented youngsters on the stage.